Figure 1. The Ionogram of a well containing Test Fragment A.These are raw values extracted from the 1.wells file. Note: The flow order does not follow a repeating 4 flow cycle of TACG but is a 32 flow cycle. I will defer the discussion of this until Part 3 of the series. All Ionograms were produced by modifying supplied python code which uses numpy, scipy and matlabplotlib packages to produce the plots. Figure 2. The Ionogram of the same well containing Test Fragment A after signal correction. These are corrected values extracted from the SFF file. Below are the bases called for this well. This was the 5th best Test Fragment A sequence read for this 314 Chip run. The first error occurring at the G 4mer towards the end. For those who are observant, you may have noticed the biggest difference between the raw (Figure 1) and corrected Ionogram (Figure 2) is the y-scale. In other words, you can infer the bases called (by rounding to the nearest integer) from Figure 2 but not Figure 1. In order for normalization to occur, we need to know how a typical signal should look like. Here is where the test fragment (ATCG) and library fragment (TACG) specific tags come in. Therefore, based on the tag sequence the first 7 flows (also called the key flows) are deterministic once the well has been classified. 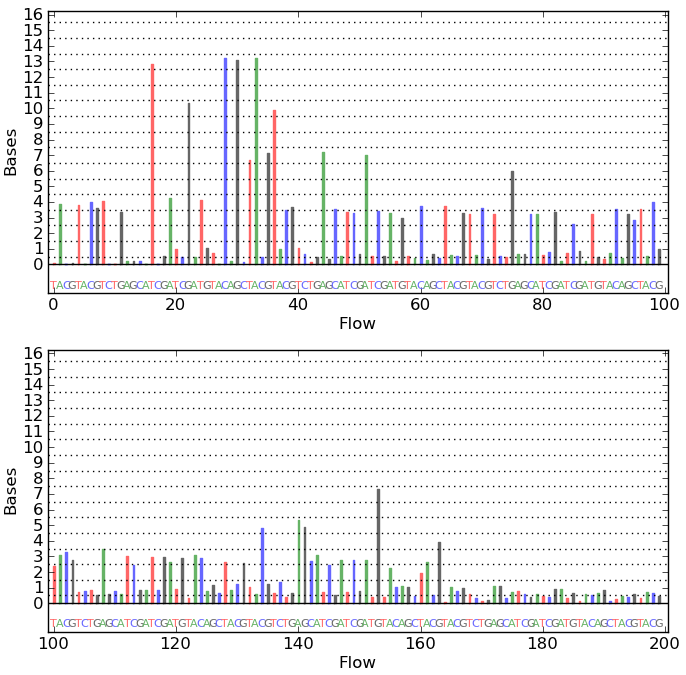 The first 7 nucleotides flowed are TACGTAC so in the case of a test fragment, values from flow 1, 4 and 6 would be typical values for 1 mers, while flows 0, 2, 3, 5 are typical values for 0 mers (i.e. background noise). I have called the first flow 0 and not 1 as this better correlates to the source code I will release at the end of the series. Why isn’t the G 1mer included in the average? I will defer this discussion to part 3 of this series. 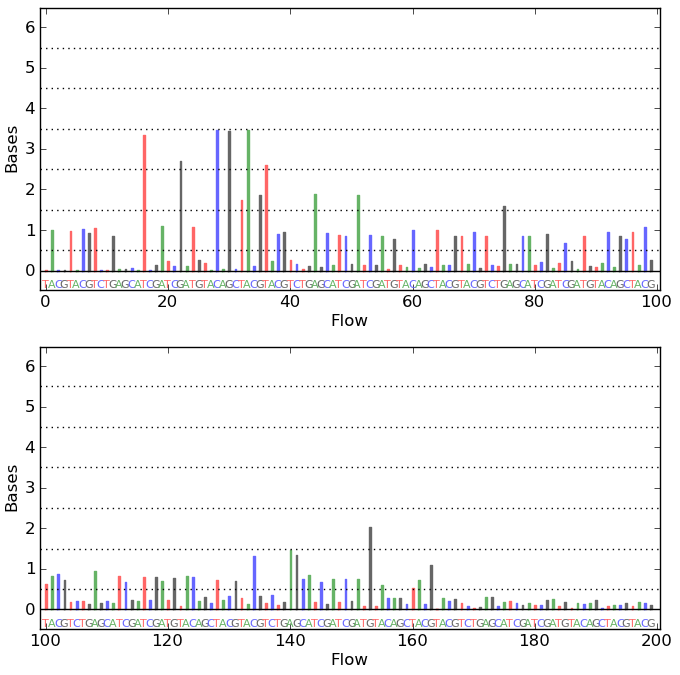 Finding the average 0mer signal from the key flows. The Ionogram below is the results of performing Steps 1-4. 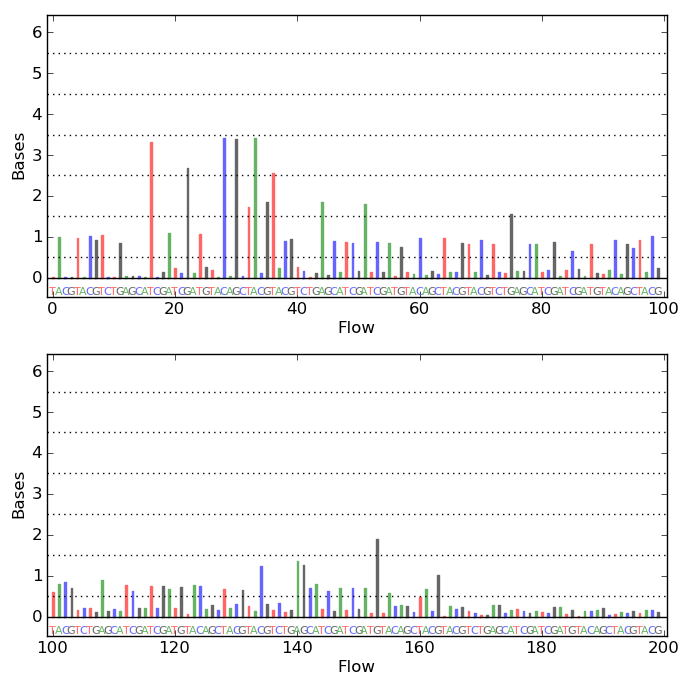 Over the number of flows, we would expect the signal to decay, which is typical of a lot of signal processing. There are many reasons for this eg. loss of active DNA polymerase, population of strands are unable to incorporate any more nucleotides, loss in sensitivity in the electrical sensors, etc. 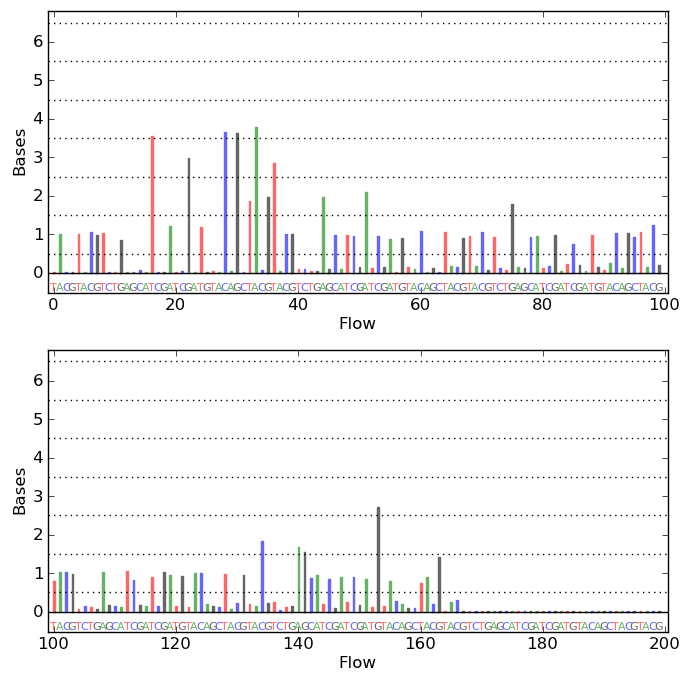 Typical fitted parameters used by the ion-Analysis is roughly 0.05% decay between flows. This correction is performed on all values before Step 3 outlined above. This ensures the 1mer estimation corrects for this signal droop. The figure below shows that a typical droop value of 0.05% has very little consequence other than eating up some CPU time. However, we may see it playing a more significant role for longer reads (i.e. 200-400 bp). For those who are observant, you may have notice a big difference between Figure 2 and the Normalization figures particularly in the later flows. This is because the signal has not been phase corrected and starts becoming an issue after X incorporation events. In the next part of this 3 part series, I will cover phase correction ad discuss the X incorporation events. Disclaimer: For the good of all mankind! This is purely my opinion and interpretations. I have tried my best to keep all analyses correct. Any resemblance of my code to that of the Life Technologies GPL code is pure coincidence and mainly due to poor creativity for variable names. This entry was posted in Ion Torrent Blogs and tagged Accuracy, base calling, Grand Challenge, Ion Torrent, Ionogram. Bookmark the permalink.